Is it her next bestseller ... Or her last words? 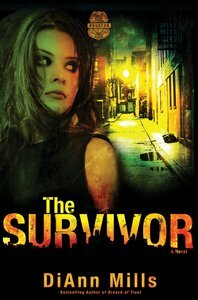 About "The Survivor (#02 in Crime Scene Houston Series)"
Customer Reviews For "The Survivor (#02 in Crime Scene Houston Series)"
Plenty of action from page 1 getting you involved in the lives and hearts of the great characters and the intriguing plot that surrounds them all. Letting God have control is never easy, as too the many questions that arise when 'the bad men' seem to win. Diann Mills covered these issues well. TV reporter-turned crime novelist Kariss Walker is approached by Dr Amy Garrett, the victim of a brutal childhood assault in which the culprit was never caught. Amy wants her story told, and asks Kariss to write it. In her personal life, Karris is recovering from having broken off her relationship with FBI agent Special Agent Santiago (Tigo) Harris, partly because of his lack of Christian faith. Tigo and his partner, Ryan Steadman, are pulled off a gang killing to investigate the carbomb murder of Joanna Yeat and her daughter. It seems at first that the real target might have been her husband, Jonathan Yeat, but the picture of the perfect family soon shows cracks. The nature of a suspense novel means that the reader knows there must be some link between these two plot lines, but it isn't immediately apparent. When it comes, it's well done, but I thought the ending was too contrived and there were a couple of minor plot points that were never properly resolved. Overall, this was a solid but not outstanding novel that will appeal to fans of Christian romantic suspense and authors such as Dee Henderson, Irene Hannon, Dani Pettrey and Susan May Warren. This is a sequel, and while it can be read as a standalone, it will be better read in sequence, as The Chase covers the first part of Kariss and Tigo's relationship. Thanks to Zondervan and Booksneeze for providing a free ebook for review. Based on a real-life cold case, The Chase, by bestselling author DiAnn Mills, teams novelist and former news-anchor Kariss Walker with FBI Special Agent Tigo Harris as they reopen an unsolved crime case and discover more than they bargained for. Will Kariss's pursuit of her dream as a suspense writer come at a deadly cost? Join in The Chase and find out.